4. Easily adjusted, locking ball and socket latch mechanism. 5. Small, space saving foot-print to bring your mouse inside your ergonomic "comfort zone". 8. Full size, full travel, tactile feedback keys with soft end-stop. 11. Compatible with Windows 2000, XP and Vista. 12. 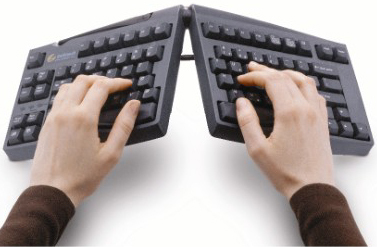 Ease of use and intuitive design allow new users to adjust the keyboard to a comfortable typing position without additional accessories or attachments. 13. Soft key touch, low activation force and full key travel distance provides keying comfort and reduces risk from "bottoming out" when keying. 14. Compact size allows for use in limited space environments, and reduces shoulder abduction when reaching for mice and other peripherals. Risk Management: A proven design and years of longevity make the standard Goldtouch Adjustable Keyboard a leading recommendation among Risk Managers, Certified Professional Ergonomists, Physical Therapists and Occupational Therapists. 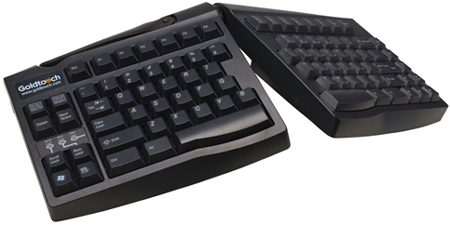 Because a Goldtouch keyboard is designed to fit the range of body types, not just an average, the standard Goldtouch Adjustable Keyboard is the only keyboard designed to properly straighten the wrists and arms while aligning with the shoulders to achieve a neutral typing posture. No other keyboard allows for the range of adjustability as a Goldtouch Adjustable keyboard. "I think that the Goldtouch is a superior product compared to the Kinesis Maxim board because it promotes good keying technique of not resting the palms, the adjustability and manipulation of the angle of the board is easy to figure out, it follows good human factors design principles due to the "one lever" option therefore facilitating the ease to customize the fit to the user's stature and needs". "I like the newer Goldtouch design because the keys are soft like a laptop". "There are no other boards that I like as much as the Goldtouch and I have tried most of them." The Kinesis Maxim board and the Goldtouch board are the same length but the Goldtouch board is smaller in depth therefore making it more innate to include with a laptop as an external peripheral". "The interface is intuitive compared to the Kinesis Maxim board" (the adjustment handle for the Goldtouch board). "The Goldtouch affords greater range of motion for hand and wrist positions encouraging neutral wrist postures with keying tasks". In a blind study of twenty government employees who began using the Goldtouch board in replacement of the QWERTY keyboard in their office setting, all users, with the exception of one user, innately figured out how to position the Goldtouch board to fit their comfort level without instruction and/or explanation. Neutral hand postures were obtained with 19 of the 20 users without explanation of how to avoid awkward wrist postures (ulnar and radial deviation) with keying providing support for innate keyboard design. ErgoDirect.com fully respects and protects your privacy. With the exception of arranging for delivery of the products ordered, we do not sell, share or rent any personal information to other parties for any reason; nor do we contact you by telephone or e-mail to solicit additional products or services.